Pesto: a bright-green wonder of a sauce comprised, of fresh basil, olive oil, pine nuts, garlic and finely grated cheese. If you love pesto, now’s the time to make some at home. Fresh basil is plentiful in late summer, which means it’s easy to get the ingredients you need to make a jar or two of your own. It’ll only take 5 – 10 minutes to make and it freezes well, so you can enjoy it even as the weather turns cool. Directions for making homemade pesto follow shortly. But first, here are a few recipe ideas to whet your appetite for this garlicky goodness. 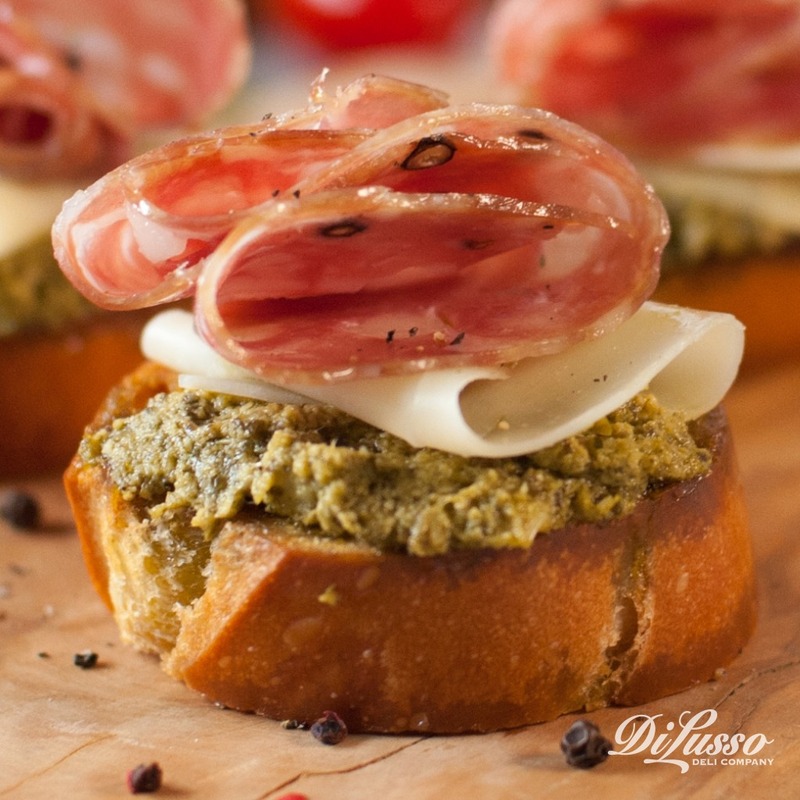 The subtle sweetness of our sopressata is a perfect match for pesto’s savory overtones in this Baked Pesto Crostini recipe. Layer the pair on toasted baguette rounds with a slice of our provolone and you’ve got a beautifully balanced antipasto on your hands. Sometimes the simplest appetizers are the best appetizers. 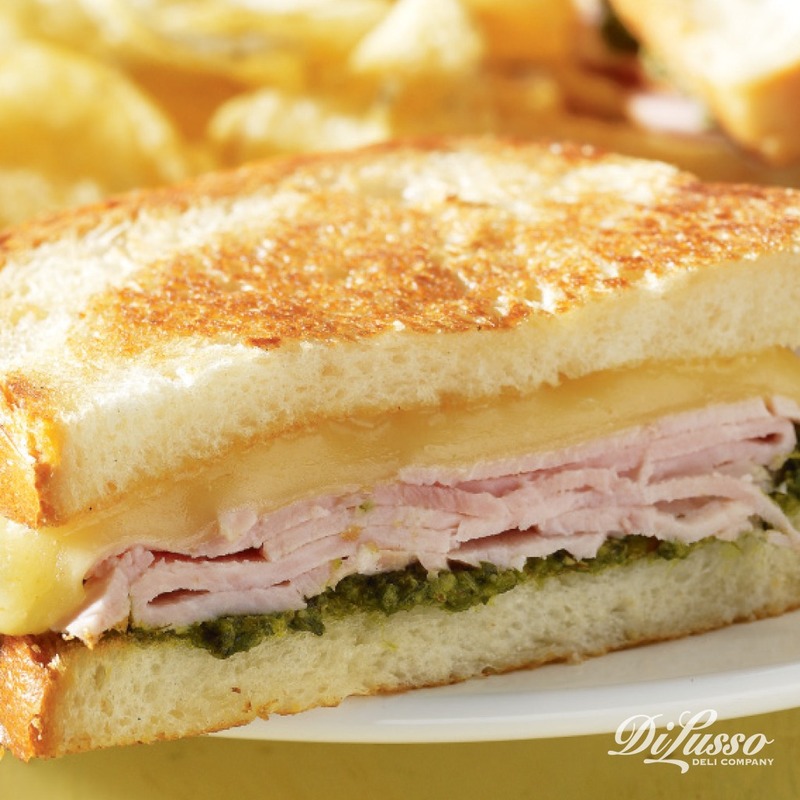 Pesto works wonders on sandwiches. 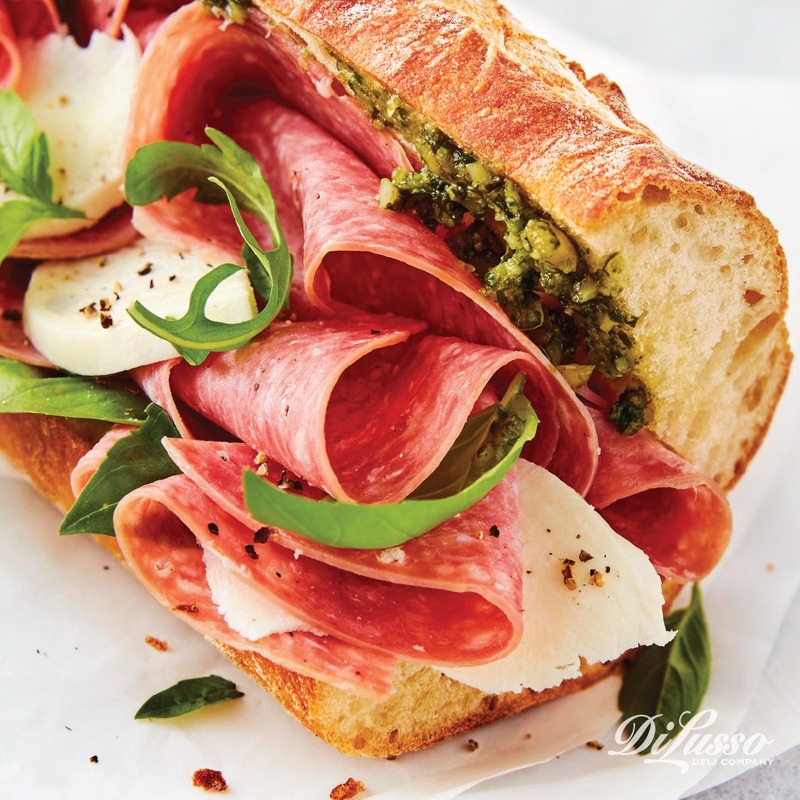 Its nutty, garlicky flair contrasts nicely with many sandwich favorites, such as the peppery arugula and our savory Genoa salami on this Fresh Italian Hoagie. It might just become a new lunchtime favorite. 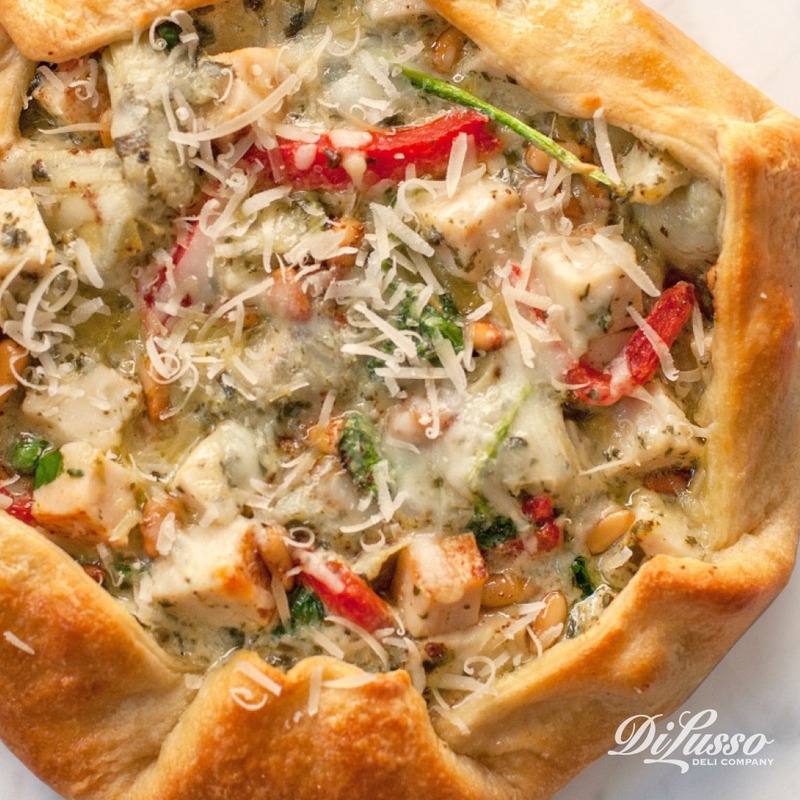 You can also toss pesto in oven-friendly recipes like this Chicken Artichoke Galette. When heated, its flavors and aroma are magnified. The flavors will coalesce effortlessly with our roasted red peppers, mozzarella and oven roasted chicken. In no time flat, your kitchen will be filled with basil’s earthy perfume. These Pesto Petites are party-perfect and full of flavor. We start these off with bite-size squares of focaccia. Then we spread them with pesto and stack with a few slices of our oven roasted chicken, Colby jack and some fresh spinach leaves. The olive oil from the pesto will soak into the bread a bit, adding even more dimension to these little bites. 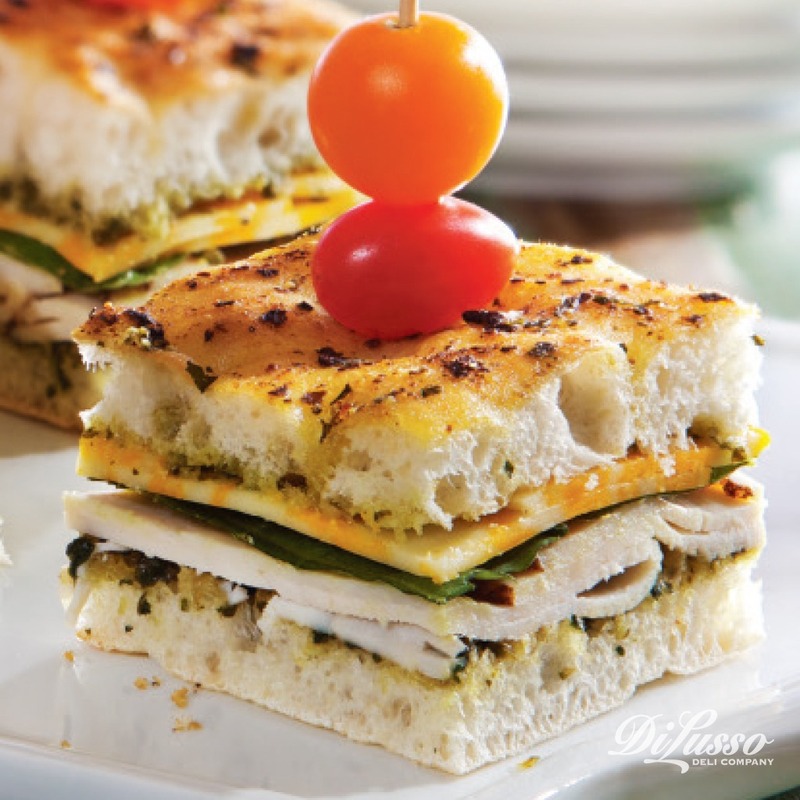 Our havarti’s creaminess pairs perfectly with pesto’s herbal tones in this Turkey, Havarti and Pesto Panini. For a touch of wood-smoked flavor, we added our smoked turkey breast. We like to think of this one as a fancy grilled cheese. 1. In a food processor or blender, mix 2 cups fresh basil leaves, 2 – 3 cloves of garlic and 1/3 cup toasted pine nuts. Turn off the machine, scrape down the sides and continue to mix until it looks evenly processed. 2. With the machine running, add 2/3 cup extra virgin olive oil in a slow, steady stream. Scrape down sides once or twice. Continue to mix until the oil emulsifies. 3. Place basil mixture in a mixing bowl. Add ½ cup freshly grated Parmesan, pecorino, Romano or Asiago cheese with kosher salt and fresh ground black pepper (to taste). 4. Add more olive oil to adjust the consistency, if needed. A thicker pesto works best on sandwiches. A slightly thinner pesto is better on pasta or in soups. Feel free to substitute other fresh herbs for the basil. Or use one cup basil and one cup fresh spinach leaves for a milder flavor. Replace pine nuts with walnuts, if desired. You can refrigerate or freeze pesto. Either way, make sure to store it in an airtight container. If you’re freezing, add a thin layer of olive oil to the top to help keep the pesto moist. You can freeze smaller portions of pesto by storing in ice cube trays covered with plastic wrap. Frozen pesto is usually most flavorful when eaten within 3 months.